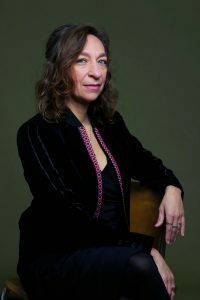 The New York Times once described the work of Calliope Tsoupaki as “dizzyingly beautiful” and the Dutch magazine TM, about theatre, music and dance, called her “Monteverdi of the 20th century”. Tsoupaki’s music blends East and West into a contemplative and spiritual whole – her motivations are deeply personal and at the same time universal in their power of expression. Her chamber opera Vita Nova received its premiere in the Korzo Theatre in The Hague in 2004 and her St. Luke Passion was first performed during the Holland Festival in 2008. In 2010, the Holland Festival once again premiered a new work by Tsoupaki: Greek Love Songs. In 2012, she composed Maria at the request of the Nederlands Blazers Ensemble (Netherlands Wind Ensemble), in which classical and folk music traditions connected with the veneration of the Virgin Mary come together. Tsoupaki composed the semi-scenic oratorio Oidípous for the Holland Festival 2014, which was performed by the baroque ensemble The Netherlands Bach Society and directed by Pierre Audi. Last year, Tsoupaki composed Mariken in de tuin der lusten (Marika in the garden of delights) for OPERA2DAY, an opera based on the story by Mariken van Nieumeghen. The music was performed by Asko|Schönberg, together with the medieval music ensemble Tetraktys. Tsoupaki has previously composed for non-Western instruments, alone and in combination with European instruments. This broadening of her scope to include historic instruments proved to be a logical continuation of her quest for an open, transparent and impassioned sound. Between 2005 and 2013, Tsoupaki composed a triptych of pieces for string quartet entitled Triptychon. The connecting theme in this triptych is light, which serves as a metaphor for the power of the inner life. Triptychon will shortly be released in its entirety on CD, performed by the Doelen Quartet.